BOTOX® Cosmetic and Signs of Aging: Do Men Require Special Treatment? Men and women both seek to minimize and prevent early signs of aging – and both men and women are often concerned with lines and wrinkles on the forehead and crow’s feet around the eyes. However, since men’s and women’s faces have different levels of facial muscles and skin thickness, this difference must be taken into account when administering BOTOX® Cosmetic treatments. Due to the fact that men’s facial muscles are typically stronger than women’s and their skin tends to be thicker, men often require larger doses of BOTOX® Cosmetic to achieve the same desired effects as in women. Historically speaking, the majority of cosmetic enhancement patients have always been women, though recently we have seen these statistics begin to change at our practice. More and more men wish to look more youthful and revitalized – and are taking action to fulfill this wish. BOTOX® Cosmetic from our board-certified dermatologist, Dr. Deborah Atkin, is typically a comfortable, convenient procedure without the need for downtime. An increasing number of men are having BOTOX® injections performed in-office every three to four months – allowing them to achieve and maintain natural-looking results for long periods of time. Because there is no downtime associated with the treatment, men can often have the procedure performed over a lunch break and return to work without anyone even knowing they were at our office. As the results of BOTOX® Cosmetic appear gradually over the following 5 to 10 days, lines and wrinkles will soften and become smoother, typically yielding a look that is natural, rested, and youthful. 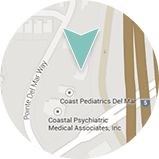 To learn more about BOTOX® Cosmetic and Dermatology & Laser of Del Mar, please contact our office today.